Cool Springs Press, 9780760357811, 160pp. Shelley Levis is a passionate horticulturist, speaker, writer, and garden designer. She is an editor and content creator for Urbanique magazine, a regular contributor to a variety of newspapers and magazines, and the voice behind the popular gardening blog Sow & Dipity. Her creative DIY garden projects have been featured in the Huffington Post, Fine Gardening and GreenCraft magazines, and other publications. I highly recommend Countertop Gardens for anyone who wants to have fresh food at their fingertips year-round. The book combines practical tips and creative approaches to get you started. In short order, tomatoes, strawberries, mushrooms and more will be at your fingertips. 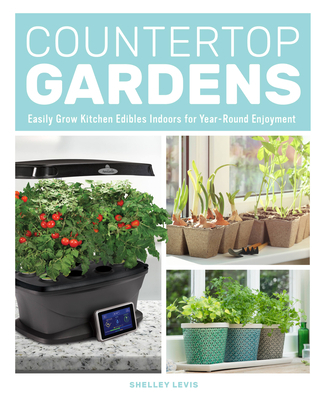 Countertop Gardens is a well thought-out book that’s sure to cure your twitching green thumb, so you can plant, grow and harvest yummy homegrown produce—no matter where you live.